In our contemporary era, technology is more and more integrated into our daily lives. We’re nearly inseparable from our phones, it seems. It rings, and you answer. But would you answer a dead man’s phone? This week, the ETSU Department of Theatre and Dance presents its production of “Dead Man’s Cell Phone.” While this play by Sarah Ruhl premiered in 2007, director and lighting designer Melissa Shafer said that its themes still feel relevant today. When Jean (played by Angel Thacker) gets annoyed with a man for not answering his phone, she takes it upon herself to pick up for him—only to discover that the man is dead. Shafer cast the show at the beginning of the semester and has been hard at work with the cast and crew since then. While she has directed before, it’s been a long time. She thinks of this as something of her directorial debut here at ETSU. “It’s been fun because it’s wearing a different hat and pushing me out of my comfort zone,” Shafer said. Shafer and Thacker both noted that the play may well push the audience toward the edges of comfort too. Ruhl’s works tend to play with the line between realism and absurdity. Shafer said the biggest challenge in this show for herself and the actors (and the audience too) has been finding a way to strike a balance between those two qualities. The play’s short run time of just 90 minutes means it flies by, but not without engaging you. “It pulls you into a world,” Thacker said. Shafer hopes that “Dead Man’s Cell Phone” will make the audience think about cell phone usage and how it affects our interaction. Thacker, one of nine cast members, said that it did that for her. “It’s shown me that it’s good to remember that balance between face-to-face and ear-to-ear,” Thacker said. 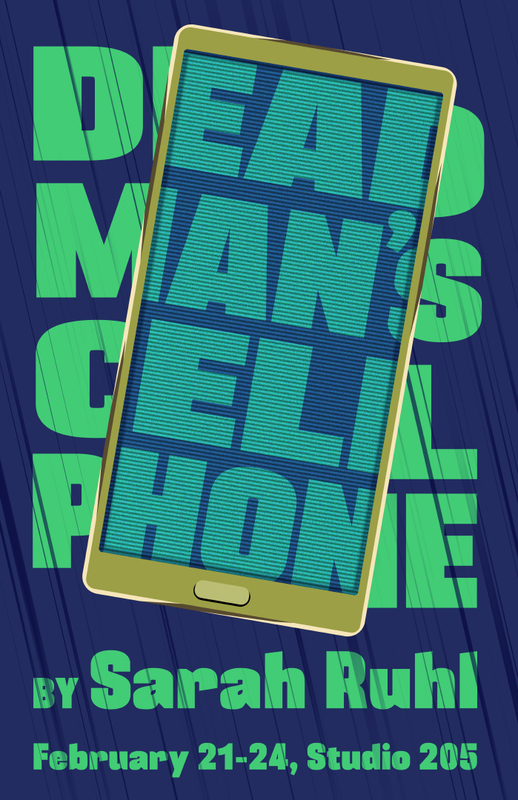 “Dead Man’s Cell Phone” will be performed in the Campus Center Building Studio 205 from Feb. 21-24 at 7:30 p.m. each night. Tickets are available through the department’s website.